Geelong is a port city located on Corio Bay and the Barwon River, in the state of Victoria, Australia, 75km south-west of the state capital, Melbourne. 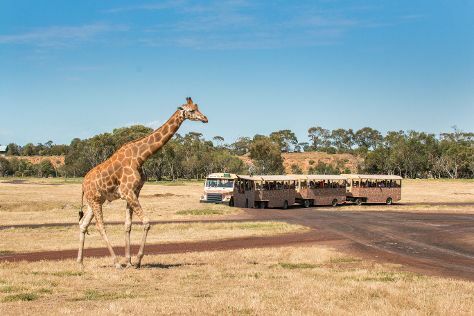 Family-friendly places like Werribee Open Range Zoo and The Nobbies Centre will thrill your kids. Explore Geelong's surroundings by going to Cowes (Koala Conservation Centre, Purple Hen Winery, & more), Ballarat (Kryal Castle, Sovereign Hill, & more) and Newhaven (National Vietnam Veterans Museum, Churchill Island Marine National Park, & more). Make the 14th (Thu) an awe-inspiring day at Lorne Beach. Spend the 6th (Fri) exploring nature at Arthurs Seat State Park. Next up on the itinerary: explore and take pictures at The Great Ocean Road, take in nature's colorful creations at Panorama Garden Estate, identify plant and animal life at Rhyll Trout and Bush Tucker Farm, and kick back and relax at Eastern Beach Reserve. To find where to stay, reviews, maps, and other tourist information, use the Geelong trip itinerary maker . If you are flying in from India, the closest major airport is Melbourne International Airport. In November, plan for daily highs up to 25°C, and evening lows to 11°C. Cap off your sightseeing on the 30th (Mon) early enough to travel back home.